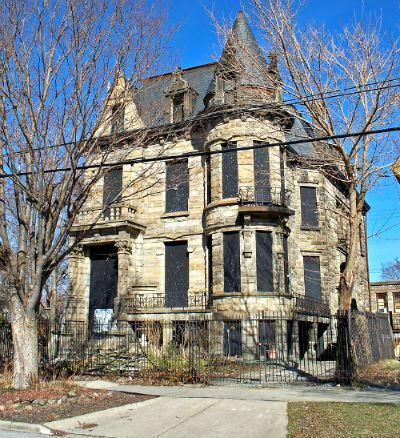 Franklin castle was originally built for a German immigrant named Hannes Tiedemann in 1881. He moved into the house with his wife and children and everything seemed to be happy in the Tiedemann household, but this would all change starting in January of 1891. After 10 happy years in the house Hannes lost his 15 year old daughter to diabetes, this blow to the family was shortly followed by the death of his mother, Wiebeka. If things were not already bad enough over the next 3 years the Tiedemann's would have to bury 3 more of their children. All of these deaths led to suspicions that there was more to Mr. Tiedemann than met the eye, though nothing was ever proved against him. His wife died from liver disease in 1895 and after this he sold the house to the Mullhauser family, before passing away himself in 1908, with no one to leave his vast wealth to. The house has changed ownership many times in the last 40 years, with the last owner purchasing it in 2011 with the intention of turning it into separate apartments. Today it is privately owned and the owners do not like to be approached with questions about the deaths or its haunted reputation. The castle is believed to be one of the most haunted buildings in the state, with it being firmly placed on pretty much any top ten list of most haunted places in Ohio you could find. I personally suspect the reason it has become so well known as a haunted location is due to the seriously wild claims about what went on here, which are dark enough to rival any other location in the country. Before I start with the tales of this place I'd just like to say I could not find any credible evidence to suggest that what is claimed to have happened here actually happened, apart from the deaths within the Tiedemann family. These deaths are by far the most well known and certainly looked suspicious, as there doesn't seem to be a cause of death for Hannes mother or the 3 children that followed after her. The only cause of death I could find was from the first daughter he lost which was officially caused by diabetes. Due to the high death rate in the house when the Tiedemann's occupied it there were a lot of suspicions raised in the community as to why this was so. One of the children he lost after his mother died was supposedly found hanging from the rafters in the attic, whether this was suicide or murder is unknown as there were no arrests. He was also known for being psychically abusive to his children, with stories of how he would beat them and lock them in secluded rooms for days at a time. There are even stories of how he would kill the new born babies he did not want, hiding them in one of the secret rooms under the house. The next most well known story of Franklin castle comes from the early 1900's when it was rented out to a supposed German socialist party who used it as their headquarters. During the next 50 years they occupied it and stories of everything from arranged assassinations and killings of its own members surfaced. With claims of the bodies of executed men being stashed in the secret rooms under the house. There's even a story about how they rented one of the rooms out to a doctor who performed extreme experiments on the people the party kidnapped, with the bodies again being stashed somewhere in the house. Another wild claim comes from an owner during the 1970's who supposedly found the skeletons of at least 10 babies in a secret room found when decorating. The coroner at the time could not date them, but claimed that they were at least 70 years old, which would align with the time the Tiedemann family occupied the residence. As for the actual paranormal activity that goes on here it would be easier to list the things which haven't been reported. Apparitions of pretty much everything have been seen here, along with all kinds of claims about strange sounds and poltergeist like activity. I would just like to add that as for the secret tunnels and rooms under the house officially non have ever been found, apart from a small service room which doesn't even come close to explaining the labyrinth of hidden chambers supposedly here.